The contrast with the Paralympic Games has been striking. Interviews have ranged from the disarmingly frank to the wildly emotional to the cautious and careful, with athletes saying what they think and feel – or not, as they chose. And the presenters, in the UK at least, seem somehow to have given them more space to react in that broad range of ways, with not so much putting the required answer into the question. It recalled clips of sporting heroics from days of old, as when Ed Hilary announced “we knocked the bugger off” without causing too much of a national scandal. I just wonder how long this will last. As attention on the Paralympics increases – and so it should – pressure will increase to train athletes in media skills. They’ll be drilled with stock phrases; they’ll learn to stand just so and smile like that and maintain eye contact. And thus we will probably lose some moments like Oscar Pistorius’s regretted post-race aspersions on Alan Oliveira after losing his 200m final. 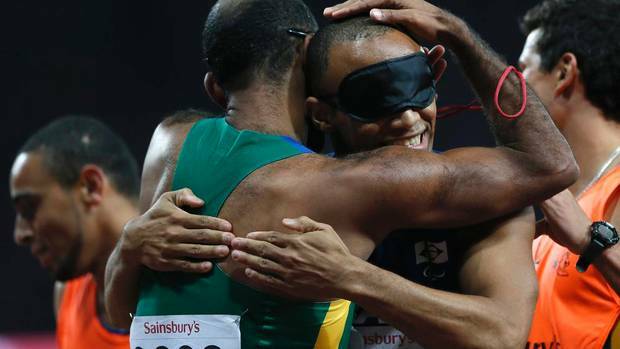 But we could also lose moments like the wild exuberance of Brazilian Daniel Silva (pictured) on the podium after winning silver in the T11 200m last night; or the direct honesty of Briton David Weir in his post-victory interviews. Those thoughts then led onto idle musings about the value of plain speaking without meaning to cause offence, or spectators rushing to take it, in all sorts of arenas, not just sporting ones. But that opens up a whole can of worms – something for another day. For the moment, I’m just enjoying the Paralympians for their athletic achievements and their refreshing variety of reactions in front of the cameras.